Thriving, successful cities around the world are measuring their progress toward improving the quality of life in their communities. The Planning Council has been leading this effort locally, in South Hampton Roads, since 2000 with its publication of An Investment in Priorities. By looking at data in human services areas such as Economic Well-Being, Education, Neighborhoods and Wellness, we are able to see how our citizens are faring and compare our region’s progress with that of the state and nation. Data leads to solutions – The importance of measuring indicators can’t be overstated. For example, in early 2000, local leaders saw the number of chronically homeless individuals continue to increase. In 2006, they began a partnership to create the nation’s first regionally funded Permanent Supportive Housing development for chronically homeless individuals. Today, the region has 320 affordable apartment units that include supportive services needed to maintain housing stability. Where possible, this report shows what it costs to not resolve pressing social issues, such as homelessness, generational poverty, substance abuse and low educational attainment. By strategically targeting investments based on what the data reveals, communities can save taxpayer money and dramatically reduce the drain on public systems. 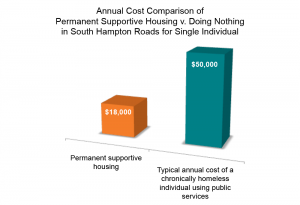 Using the example of chronic homelessness, the graph here illustrates the cost of doing nothing versus the cost of investing in solutions (Permanent Supportive Housing). The annual investment to provide Permanent Supportive Housing to one individual experiencing homelessness is about $18,000 while it can cost up to $50,000 in public funds to cover the cost of a single chronic user of jails, hospitals, Emergency Rooms, and emergency medical transport. The report provides policymakers, funders, researchers and citizens with data on employment, education, neighborhoods and wellness. By tracking and analyzing these human services indicators over the past fifteen years, we can now see some of the significant and persistent needs facing the region. Dashboard: This report begins with a quick reference dashboard indicating the region’s performance on 26 indicators, and compares the region’s performance with that of the state. Indicators: The second section provides an in-depth look at the four visions of a healthy, viable community; Education; Economic Well-Being; Neighborhoods; and Wellness. Best Practices in South Hampton Roads: The third section highlights local best practices, such as Permanent Supportive Housing, that are founded on data-driven decision making. With guidance from this data, communities around the country are creating, testing, sharing and implementing best practice models that have consistently helped meet challenges and demonstrate success. Data tables and endnotes are provided in appendices for further research. This report is made possible by generous support from the Hampton Roads Community Foundation. A quick reference guide indicating the region’s performance on 26 indicators, and comparing the region to the State. A growing and diversified regional economy is vital for citizens to be economically-self sufficient. Education in its broadest context is the key factor in ensuring that citizens are self-sufficient both economically and socially. Decent, affordable, and desirable neighborhoods contribute to residents’ stability and safety. The concept of wellness addresses not only the medical health of individuals but also the social health of family and other interpersonal relationships.